Every golfer knows the quickest way to drop strokes off your game is around and, especially, on the green. Check out our golf putting aids reviews and get on the path to better golf. 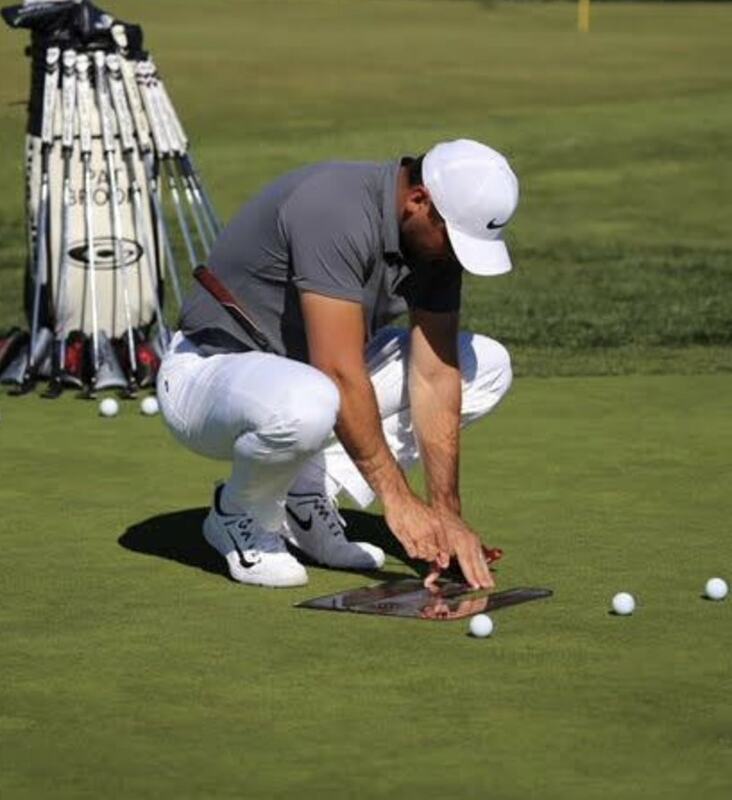 I’ve looked around for the hottest and highest rated putting trainers in the game and put them here on this page. Putting is one of the most important aspects of golf. A three-foot putt takes as many strokes as a 300-yard drive. Plus, the average golfer uses the putter 41 percent of the time, according to Golf Digest. There’s just more mileage to be gained from improving your putting than improving your anything else. Practice makes perfect, and putting is a skill that can be honed. Putting training aids can help you get feedback about your stroke, learn in a variety of ways, repeat what’s working and align your shot. They can help you be more consistent on the green so that you putt more confidently. However, there are hundreds of putting aids out there. You could experiment with different options, but I’ve invested in doing that hard work for you. In this article, I review the best putting training aids so that you can score more birdies. Although alignment is important when it comes to putting, so is speed. There’s a certain amount of push that you need to deliver to the ball to make it hit its mark without flying over it or falling short. The pace of putting is difficult to practice when you’re not on the green. That’s where the Puttout Pressure Putt Trainer comes in. 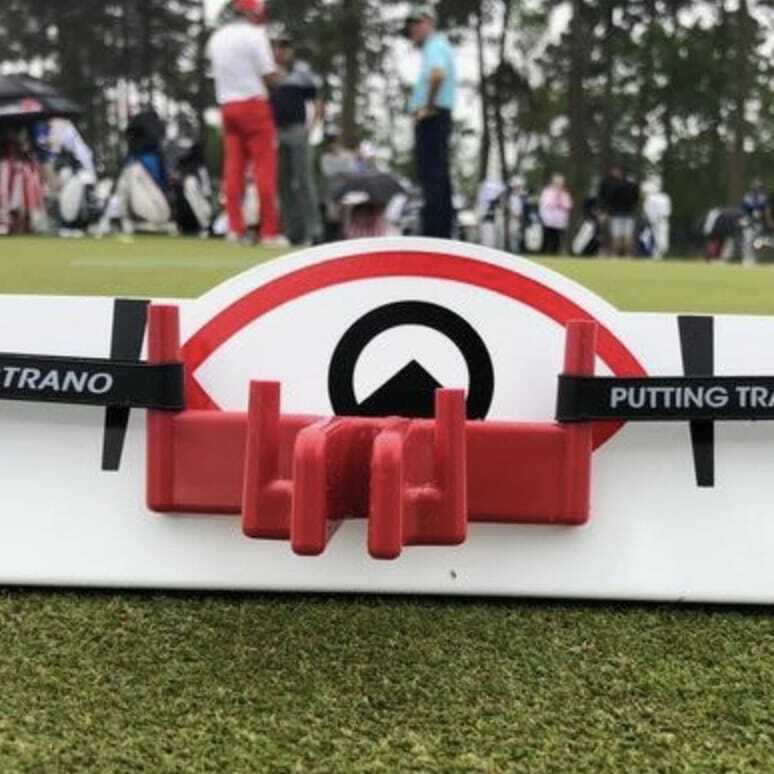 This golf putting aid recreates the pressure of a putting drill while giving you feedback about your stroke. The Puttout Pressure Putt Trainer features a white circle that’s the same size as a golf hole. That gives you a realistic target to aim for. Behind the “hole” is a sloped ramp that’s designed to either capture the ball if you’ve hit it with the perfect line and pressure or return the ball to you. If the ball comes back, you get good feedback about your putt. This aid will return the ball to the same distance by which it would have missed the hole. It holds the ball if you’ve made a perfect putt. You can’t putt accurately if you don’t have meticulous aim. Part of this skill involves creating a sightline from the ball to the hole. However, that doesn’t tell the whole story. The way that you connect with the ball also guides its path. Alignment aids can help you make contact at the center of the putter face, create a line in your mind’s eye to direct your ball and ultimately improve your short game. This is one of the best ways to improve your handicap. You won’t improve your putts if you don’t practice. Alignment aids are a great way to practice with intention and get feedback every time you putt. 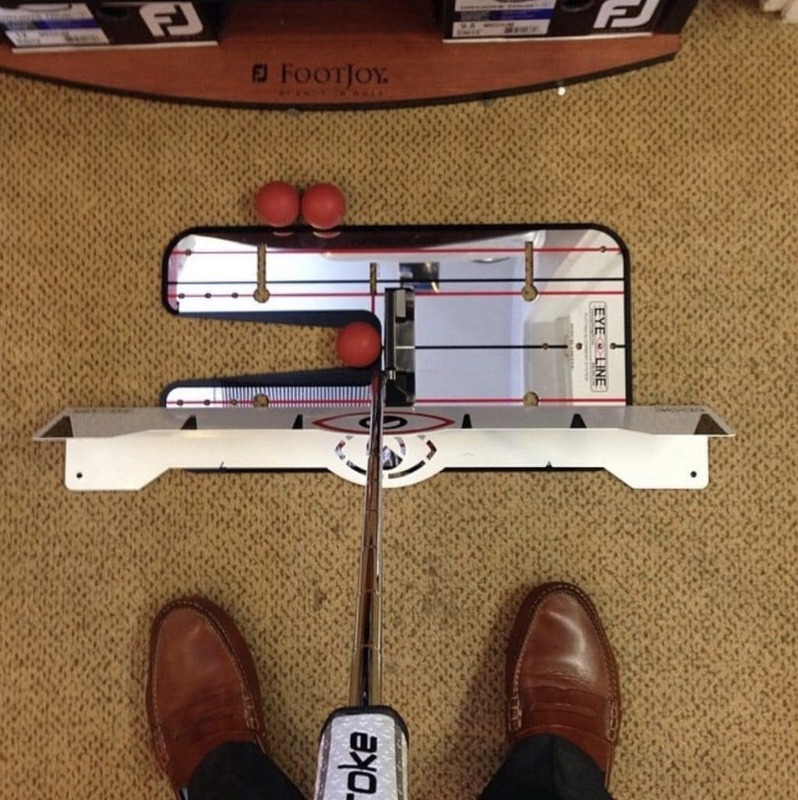 A putting alignment mirror helps you check your setup and alignment every time you hit the green. Over time, using it can help you develop a consistent stroke. This 12 x 6-inch mirror has sight lines on it so that you can set up your putt perfectly. Use the mirror to make sure that your eyes are directly over the ball and check your body alignment. Use the painted lines on the mirror to line up the face of your putter. You can create a tee gate on the mirror to optimize the position of your putter as you swing. 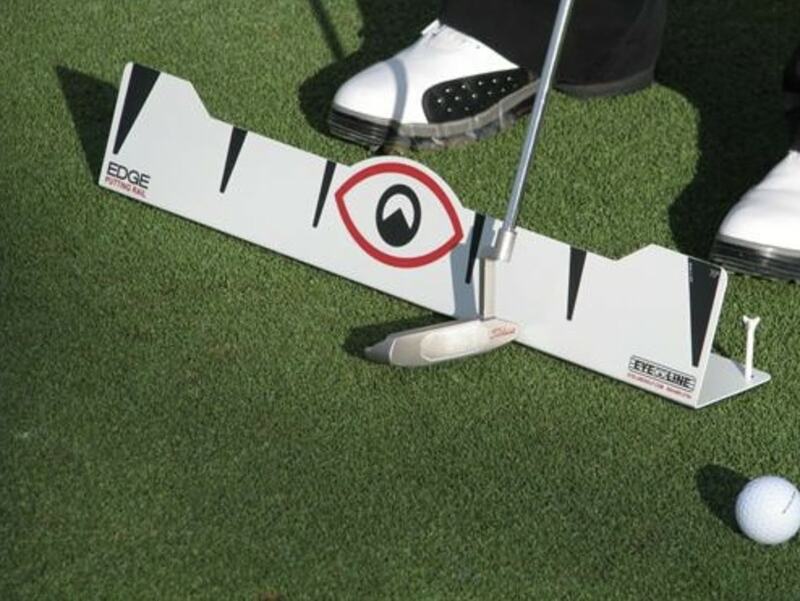 This putting laser ensures a smooth, straight stroke with instant visual cues. 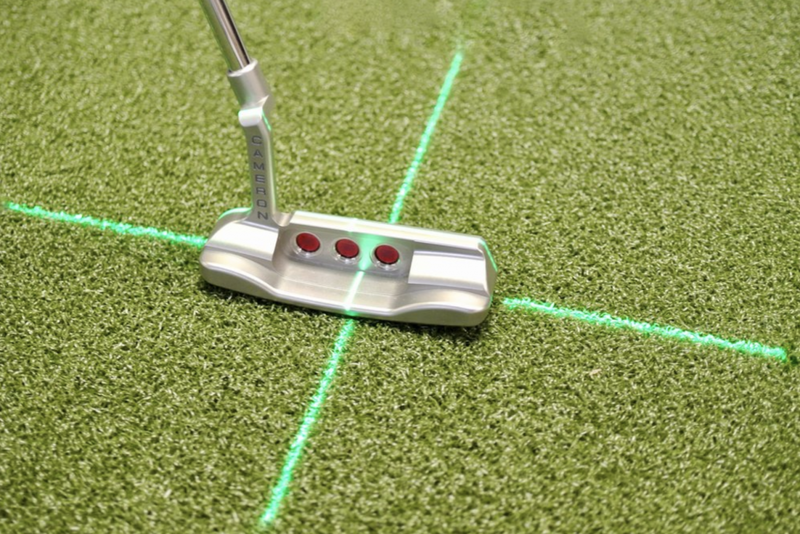 Attach the laser to the shaft of your putter, lining it up so that it bisects the head. If your hands are quiet while you putt, the ball will follow the straight line created by the laser. If you rotate your hands or body, you’ll see the ball veer from the line. This works best when you are working with a guideline that’s already on the floor. Line the laser up with the existing guide, and you’ll notice instantly when you’ve moved off the path. Tracking the laser on your guide before trying to hit the ball can help you create a consistently straight stroke. Lining your ball up correctly only fixes one aspect of your short game. Speed is just as important as alignment. 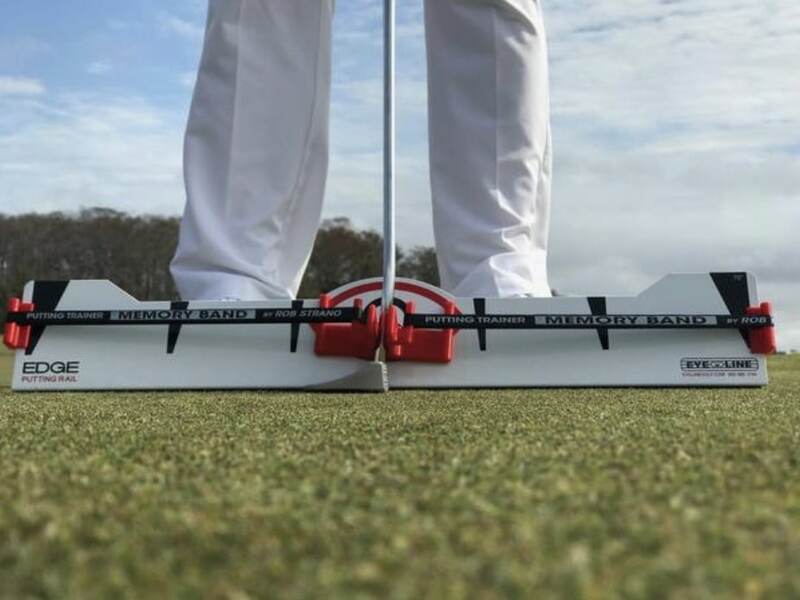 With the Slot Trainer System by Jon and Jim McLean, you can work on your speed and alignment. Set up gates using tees. If you don’t hit the ball straight right off the bat, it will hit the gates. Once you’ve practiced getting a straight shot, you can focus on your speed. You might need to experiment with the angle of the slot trainer system and the setup so that you can determine a path through a sloping green. This is a great tool to use to warm up before playing a round of golf. You can also use it indoors or outside on your off days to provide consistent practice. 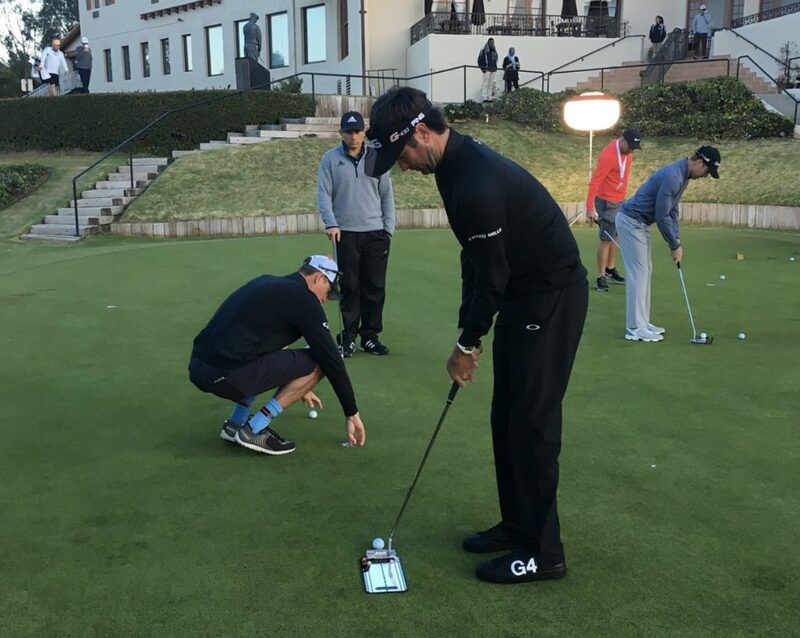 Practicing your putting is important, especially when you don’t have a chance to get on the green. Unfortunately, the texture of the grass in your backyard or the carpet in your living room isn’t totally authentic. 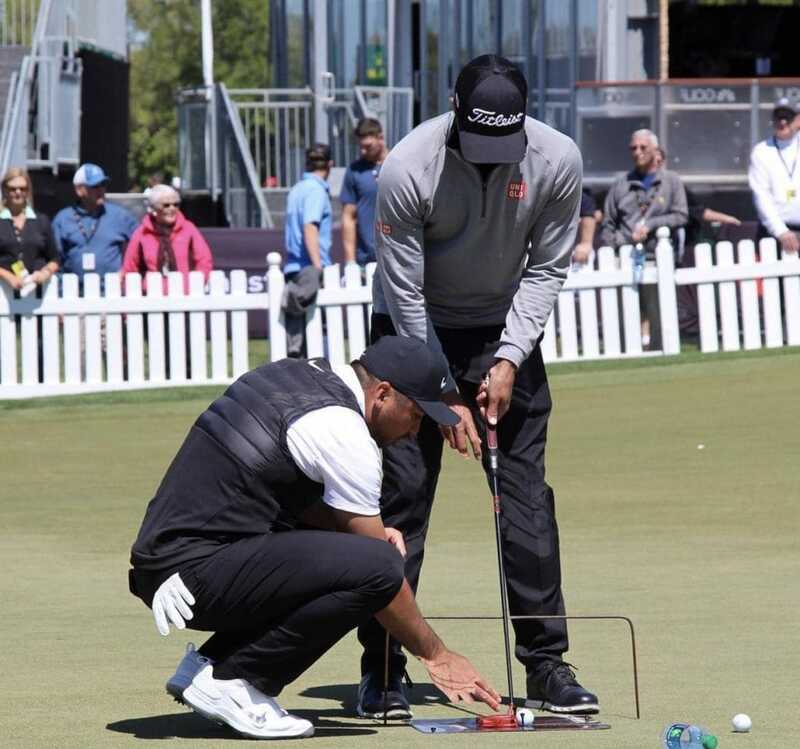 A putting mat can replicate the smooth feel of a green for realistic practice sessions that easily transition to the golf course. 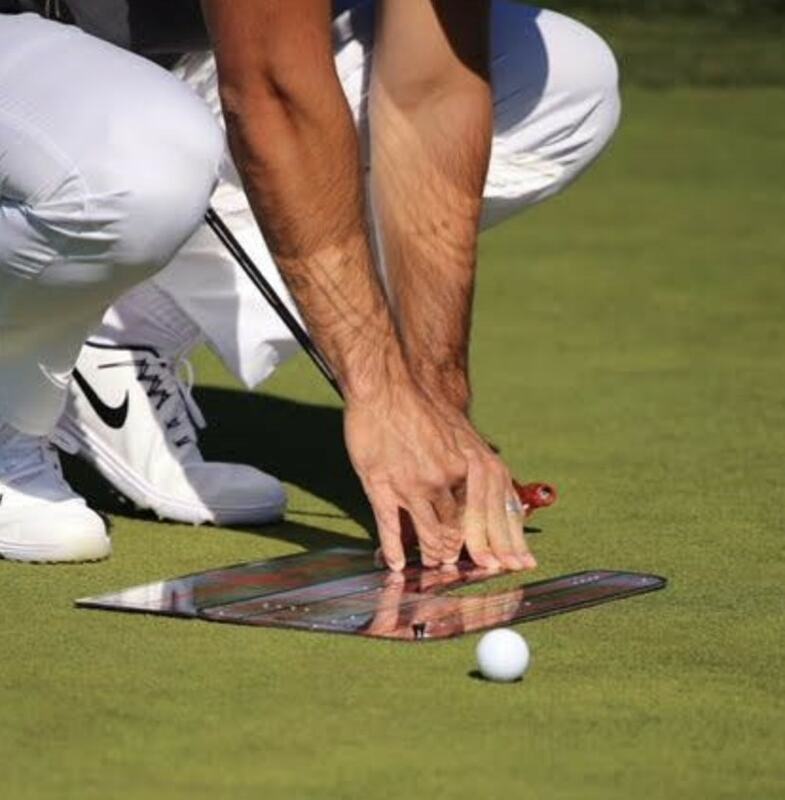 Using a putting mat can help you build confidence. It also gives you a chance to practice using your other putting aids. You can focus on feel, setup and stroke without leaving the comfort of your own home. You may get really good at putting the length of your mat. 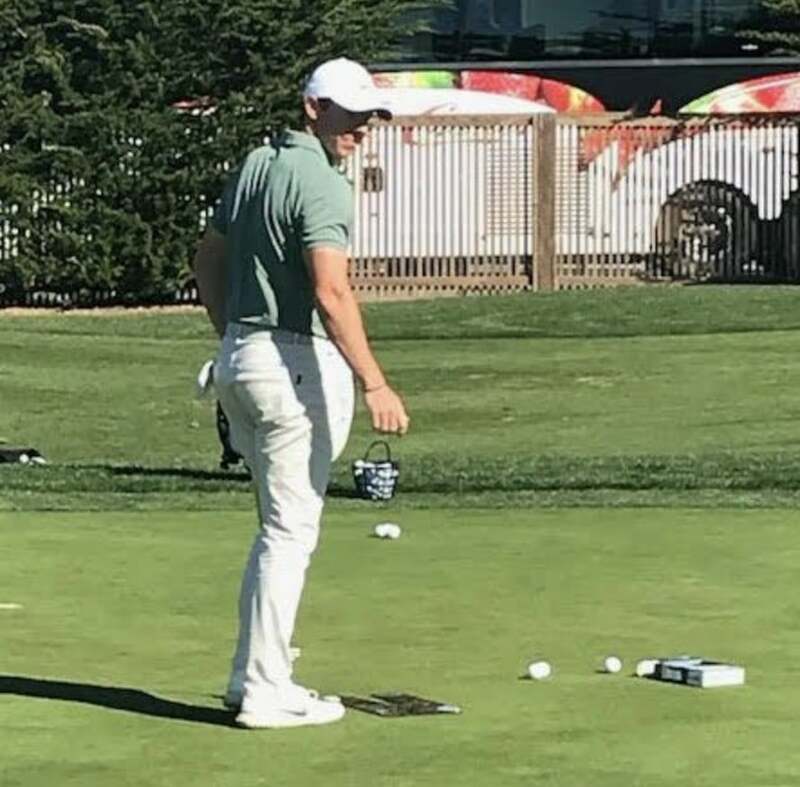 The downside is that you might not get practice making longer putts. 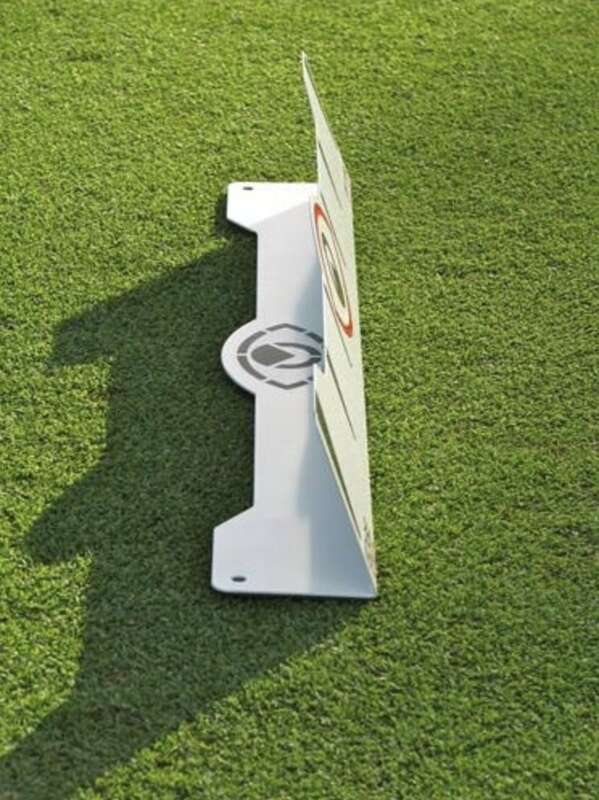 The Eyeline Golf Special Edition Putting Green Mat is 2 feet wide, 10 feet long and includes one cup. The long length allows you to practice putts from multiple distances. It offers plenty of versatility without taking up a lot of room. The tour-grade turf feels like freshly cut grass. Your ball will roll perfectly whether you’re practicing chips or putts. One of the frustrating features of many golf putting mats is their tendency to bunch up while you play. This one stays flat stroke after stroke. You can use the included break snake to create undulations that mimic the feel of a realistic golf course. This helps you practice speed, pressure and alignment on an unpredictable surface. You might imagine that you’re supposed to swing your putter in a completely straight line. That would be true if you were straddling the ball and hitting it with a croquet mallet. However, because your feet are both planted on one side of the ball in golf, physics require you to swing with a slight arc. If you try to swing straight back and through, you’ll probably close the putter face on the backswing and open it as you connect with the ball and follow through. Developing the perfect arc will help you keep the clubface square on impact. Developing the muscle memory for this type of stroke can be difficult without a training aid. Putting arc trainers help your putter travel properly so that you deliver solid putts every time. The standard lie angle of a putter is about 70°. Therefore, it’s not designed to swing straight back and through. 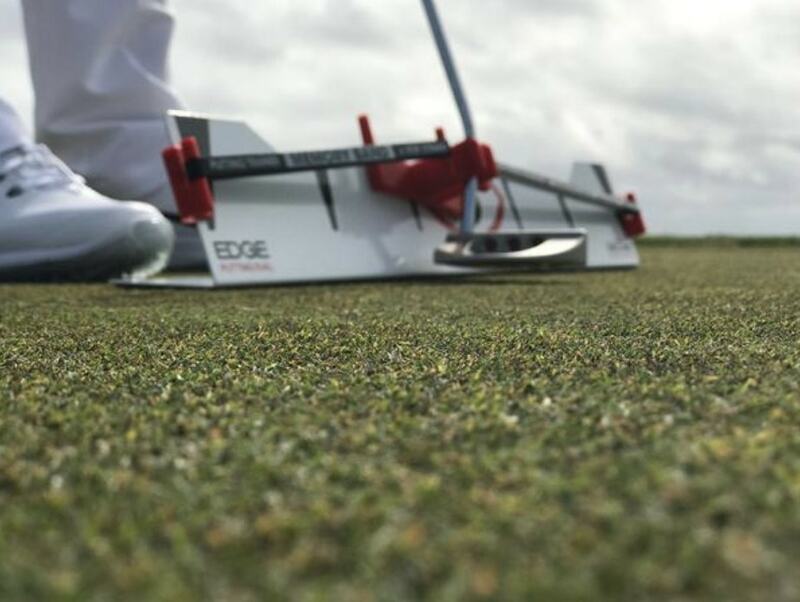 The Edge Putting Rail is designed to help you perfect your putting arc. At first glance, you might wonder how a straight putting rail allows you to develop an arced stroke. It’s all in the angle of the rail. 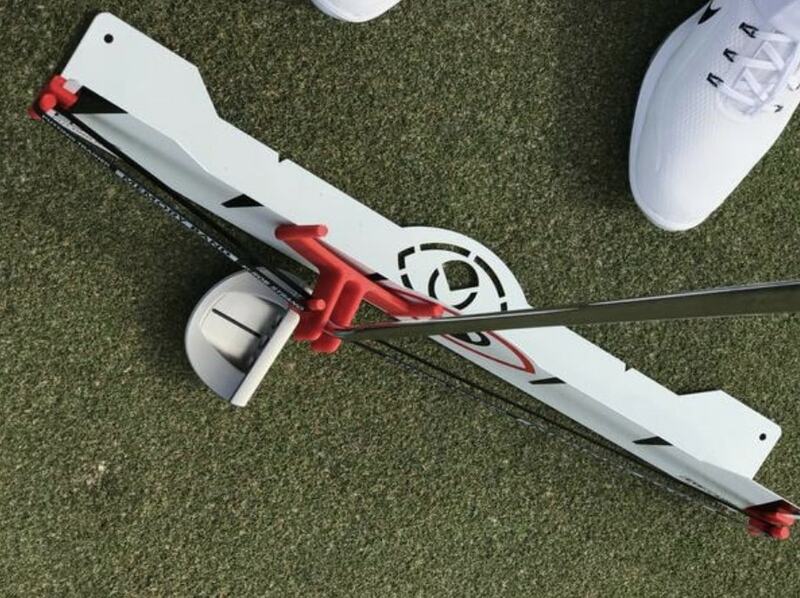 The putting trainer is bent at 70 degrees. When you maintain contact between the heel of your putter and the surface of the rail, the putter will arc inward as it rises up the rail’s slope at the beginning and end of your stroke. You’ll hear and feel the geometry as you guide your putter. The Edge Putting Rail allows you to align your shot and ensure a consistent stroke path and length. For right-handed golfers, you should set up the line of the putting rail with the left side of the hole. Stand behind it and practice some putting strokes. The heel of your putter should make contact with the rail throughout the stroke. You will get auditory feedback from the sound that the putter makes as it glides along the rail. The black lines on the rail will also let you see the length of your backstroke and follow-through. You can develop your muscle memory even more effectively by adding muscle resistance to your practice. The memory band system for the Edge Putting Rail is one of the best putting aids because it’s designed to make your muscles work harder with each stroke. Because of the intensity of the effort and the repetition, you’ll solidify the motion into your muscle memory. 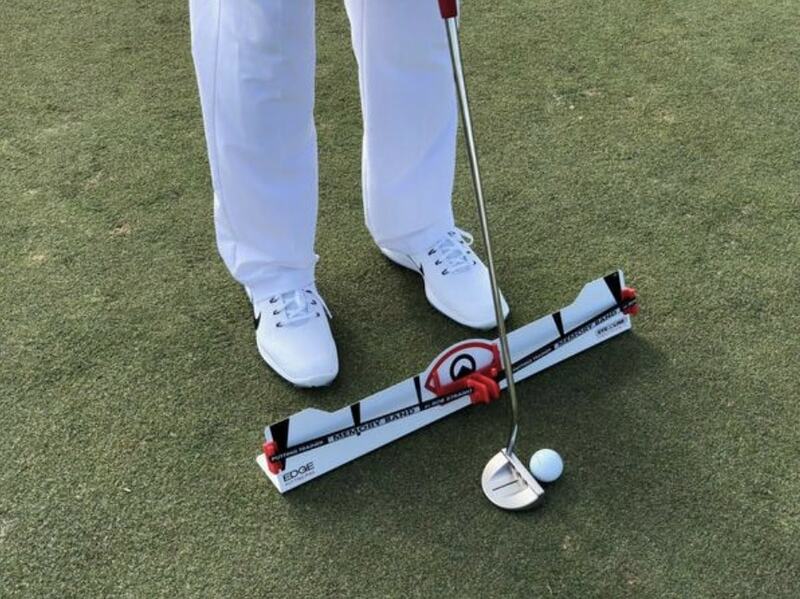 Although the memory band system is designed to work with the Edge Putting Rail, which sets you up with a perfect putting arc, it is especially effective when it comes to training the length of your backswing and follow-through. Practice a few times with resistance, and feel how your body repeats the new stroke when you take the aid away. I really hope you found our golf putting aids reviews helpful and give at least of them a try. I’m confident they can only help your game.